Tattoos of geographical coordinates became very popular in the past few years. They can have very different meanings which are always very personal. This profound personal meaning is what it makes them so attractive. Coordinates tattoo means something unique and special for each person, and at the same time looks beautiful on the body. There are many options of coordinate tattoos since they are small and everything depends on your creativity. Coordinate tattoos are striking both visually and symbolically. Of course, like any other tattoo, it can have a large number of various meanings. However, they are usually meant to mark something significant and unique. The fact that it points to a specific location makes it so unique. The person who chooses this kind of tattoo may want to remember a significant event of his life or to mark his child’s birthplace. If you are looking for coordinate tattoo ideas – stay with us for a while! With geographical coordinates, you can determine the position of any point on the earth. To find an exact location, we are using a geographic coordinate system which consists of a series of numbers. The first numbers represent a vertical position, and the other numbers stand for the horizontal position. Often, the coordinates are longitude, latitude, and elevation. The earth is not ideally spherical but instead has an irregular shape, so the expansion of a degree of latitude or longitude varies at different places. The geographical coordinates point to a specific place on the earth. It can be a country, a city, your house, street or an empty spot in the middle of the desert. There is a coordinate for every single place on earth. So, people who decide to get a coordinates tattoo usually know that place very well, and it has a great significance for them. In most cases, people mark their hometown or a house where they grew up. Others want to have the coordinates of the location where they met their partner or experienced otherworldly feelings. – Coordinates tattoo may refer to a specific place that had vital importance in our lives, and we don’t want to forget it. In other words, it may be both bad or good experiences. For example, it can mark a location of your parents’ grave, or it can refer to a place where you gave your childbirth. – With this in mind, coordinates tattoos have a very close relation to the symbol of home, family, and the origin of a person. 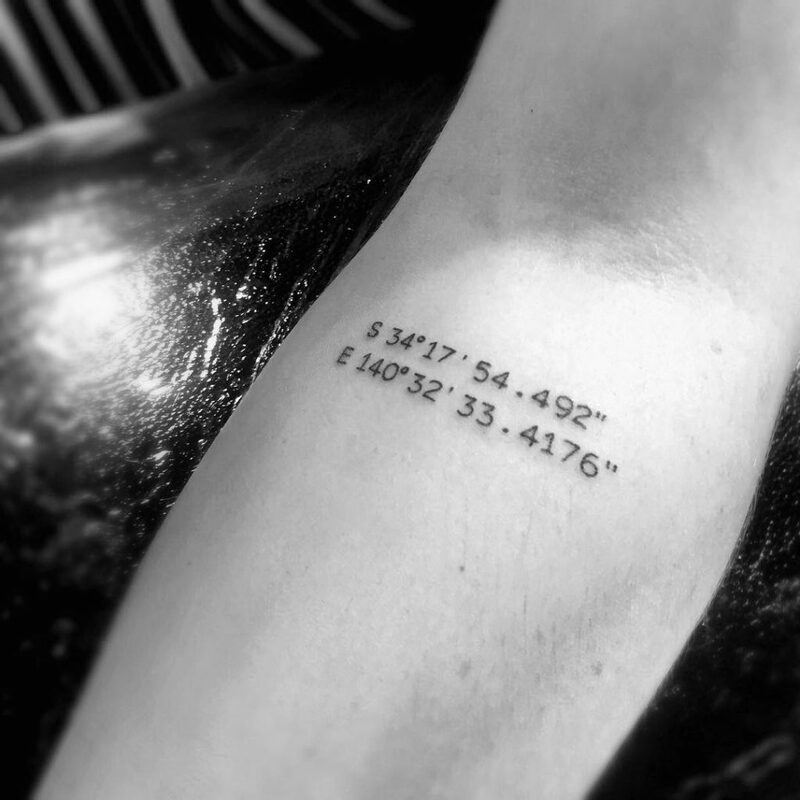 Maybe you’re far away from home, and you won’t be able to come back soon – a coordinates tattoo will remind you of your home and family. Or maybe you want to mark your grandparent’s graveyard and in this way to remember your roots. – Coordinates tattoos are also a perfect choice for travelers. Of course, we wouldn’t recommend getting a coordinate tattoo of each place you’ve visited. Instead only of those places who changed your life. – Children birthplaces. Angelina Jolie is probably the most famous person with coordinates tattoos. Each coordinate represents one of her children: the coordinates point to birthplace or the place of adoption. What other elements should I use with coordinates tattoo? – Sailor stuff such as anchor, rope, compass. – Plane, map or globe. – Animals, plants or flowers. Whichever reason you will choose, the coordinates will tell an interesting story about your life and themselves. Many people spend a lot of time selecting a tattoo because they want it to mean something special. And coordinate tattoos always have a story behind them. So, it is an excellent way to remember an important event, person or place that evokes feelings of friendship or love and reminds us of a beautiful experience. – A ubiquitous body part for the coordinates and other tats are the forearms. It will always be well-visible to you, and you will be able to cover it quickly if you need. – Another place for a coordinates tattoo is the back. It will only be visible when showering or at the pool and the beach. Moreover, if you want it always to be visible, you can choose the upper back, near your neck. In this way, you’ll be able to expose your tattoo by wearing something like a tank top. – If you already have tattoos and you’re sure that you won’t have any problems with it – neck is a perfect choice. The neck is more popular among the men, then women, since they don’t wear long hair. But it is an ideal place for a small coordinates tattoo for women as well. 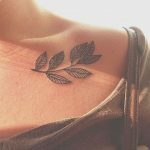 – A very intimate and delicate area for a coordinates tattoo is the clavicle or the collarbone. For women, we also recommend the ankle as it is only be seen with a certain type of footwear, so if you don’t feel like showing it – it’s a perfect choice.